Excavator pipelayer conversion kit is used to convert an excavator to pipelayer. It includes two winches that lift a frame composed of a boom and a block with hook. All the movements are controlled by the operator in the cabin of the excavator. 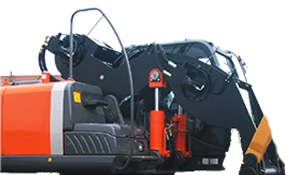 The maximum lifting capacity is with the boom completely lifted and can change from the basic machine where the kit is installed. As this modification is not permanent, it makes it possible to restore the excavator to its original condition. Less capital investment than purchase a pipelayer. Unlike standard pipe laying tractors, the side-boom excavator can be transported without having to remove the boom or the counterweights.